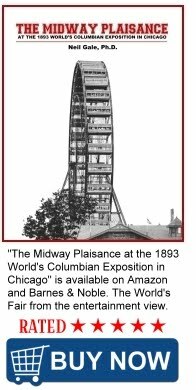 The Digital Research Library of Illinois History Journal™: A Manual 'Ferris' Wheel at the Old Catlin Illinois Fairgrounds Kills a Young Girl in 1876. A Manual 'Ferris' Wheel at the Old Catlin Illinois Fairgrounds Kills a Young Girl in 1876. The Ferris wheel originally called 'Ups and Downs,' among other names, was without power and was operated by men who manually pushed the cars around as they came to them. The directors of the fair were afraid the “contraption,” as they termed it, was unsafe and refused to give the owner permission to operate it on the fairgrounds. 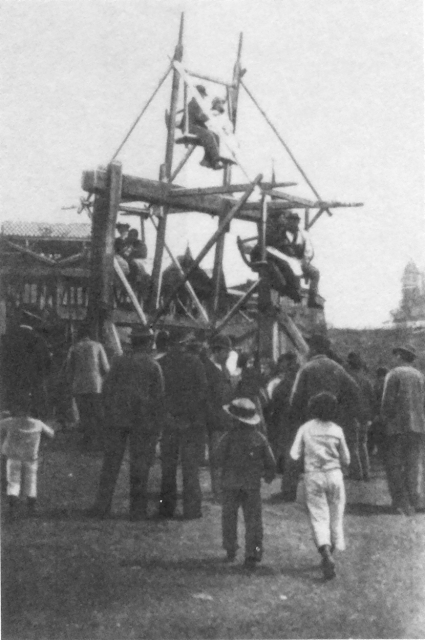 The man who had charge of the wheel placed it just outside the fence which enclosed the fairground and on the first day an attempt was made to operate it --- it collapsed. feet beyond the carriages served as handles for manually turning the ride. One person, a young girl, was killed and several other people were injured. The owner escaped by mounting a horse and riding swiftly away. He was never apprehended and escaped facing a charge of manslaughter. [NOTE] The first Catlin Fair was a one day event organized in 1850 and held on the site of the First Presbyterian Church. It was moved for the third year to Butler’s Point , and continued there for 40 more years without profit. Although this article is about 1876, I use the term "Ferris wheel" (aka: Observation Wheel) which was 1st coined at the Chicago World's Columbian Exposition in 1893, is used for the benefit of the readers visualization. Butler's Point - James Butler settled on land which lay just to the west of Catlin in 1819 and the area became known as Butler's Point. When a railway station was built where Catlin is now located, trade and residences drifted to the better facilities, and Butler's Point was lost in Catlin. 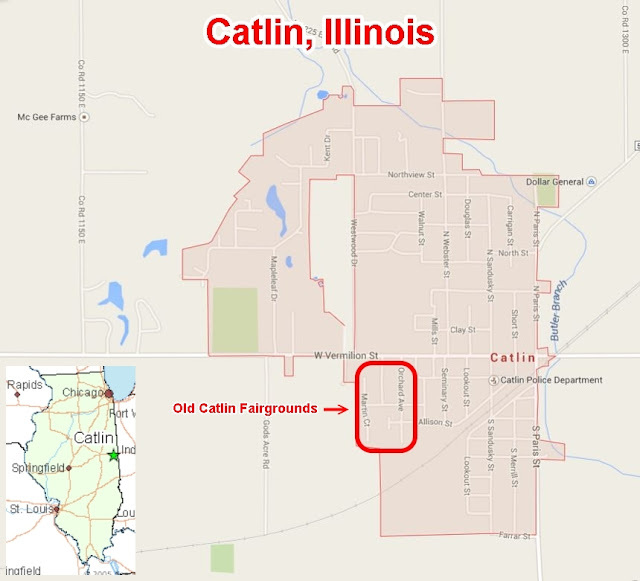 This village was named Catlin on account of that being the name of one of officers of the Wabash railroad.